"Citra, mango, and pineapple aromas abound; but make no mistake, there is no fruit here, just a serious dry-hop regimen of Citra and Amarillo hops. We put in just enough malt backbone to balance out the flavor, but Citra Double IPA is as close as it gets to chewing on a hop vine. Enjoy this one fresh - at least while you can get your hands on it!" So here we have one of my "bucket list" beers. 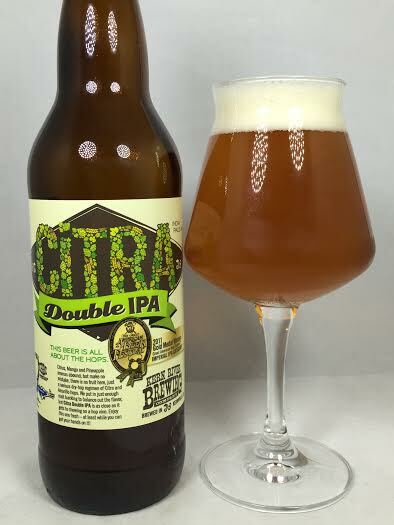 When I first got serious about the craft beer game, Kern River Citra was critically acclaimed and one of the highest-rated DIPA's on the planet. It was one of the "must haves" of the craft beer world. Even today, when it is released, the brewery hold a lottery system with only a select few getting the chance to purchase bottles. I consider myself lucky enough to have one to myself. Pours a hazy, but slightly transparent dark orange with two fingers of off-white head. The aroma is very sweet. Overly ripe peach and sweet, almost sugary malts are most noticeable. As it warms pure peach and mango juice come forward and dominate. A lot of West Coast influence on the taste as a deep flavor of garlic and onion strike me first. The malts carry a pretty good influence here as the taste is leaning towards the sweeter side. The hop bitterness is mostly wet and dank with surprising moments of spruce. Not a lot of the fruit juice carries over to the taste, but there is a big enough presence of mango with a tiny amount of pineapple to be accounted for. The end has almost a powdery, bready, and doughy taste which I would have preferred come earlier as I wanted some more peach and mango to make the finish refreshing. Mouthfeel is big and full for the 8.0% DIPA that it should be, but the body does have moments where it is syrupy. No alcohol presence to slow you down, but the thick body and sweet malts might be tough for some to take down. Kern River Citra came in with a mighty big reputation and is still heralded as one of the best DIPA's on the planet. Does ThrewRedButter fell that way? Ehhhhh, not really. I think it's a solid example of a big West Coast DIPA with the dank onion and garlic notes, sweet malts, and an almost resinous body. Is that necessarily what blows wind up my dress? No, I just prefer the IPA's from New England with more of an emphasis on creamy mouthfeels and fruity hop explosions. Kern River Citra is comparable to a Stone RuinTen which is much easier to acquire. At the end of the day, this is still good, but there's no need to give up an arm and a leg for it. Sorry.